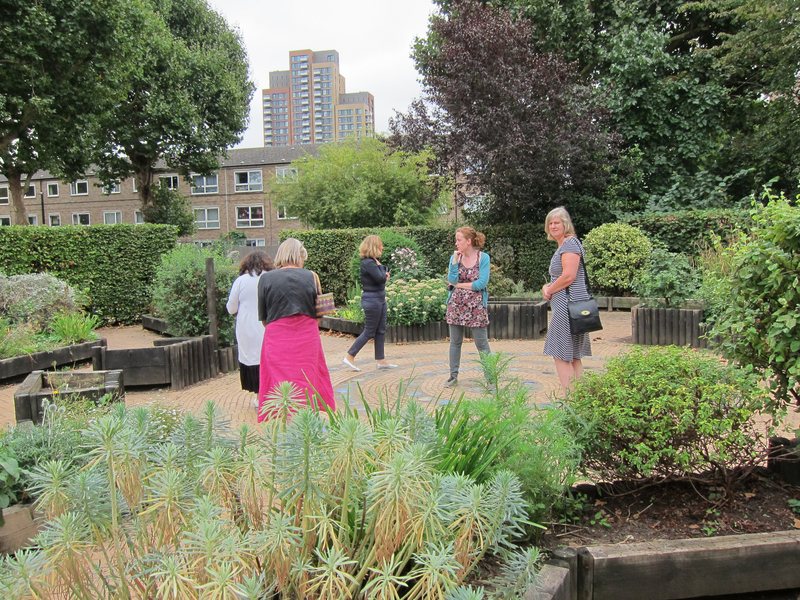 Unlocking community gems in the heart of London. 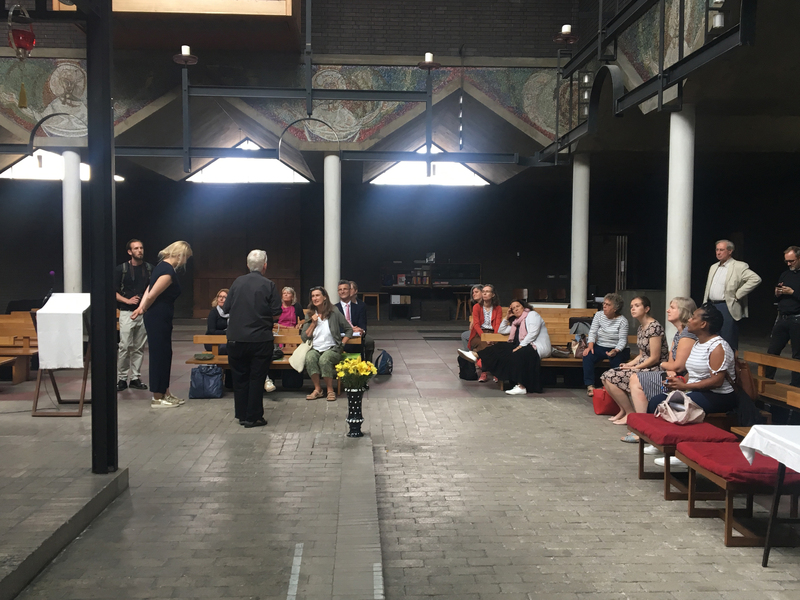 The latest Study Tour event organised by the Empowering Design Practices (EDP) research project on the 22nd August, was an inspirational opportunity to explore the potential for community-led design to enhance and reimagine historic places of worship. Through site visits to three unique places in Bow, East London, the focus was on how these buildings can become more vibrant, open and sustainable community resources that respect and enhance their existing heritage. As a new team member at The Glass-House, the prospect of joining as a participant was a great opportunity for me to meet my future colleagues and experience the project from ‘the other side’. 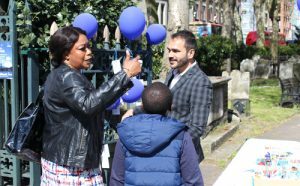 Entering almost entirely unaware of the modern position of churches in East London, I left the tour with a real sense of the vital role they can define for themselves, continuing to be relevant and well used spaces by local people within increasingly non-Christian communities. Reinventing a church as a multi-faith or secular enterprise that generates much needed income, without alienating the churchgoing population, is by no means a simple process. The day provided a fantastic opportunity for the attendees to hear about the rewards, and most importantly learn from the challenges faced by such an undertaking, before embarking on their own modernisation projects. 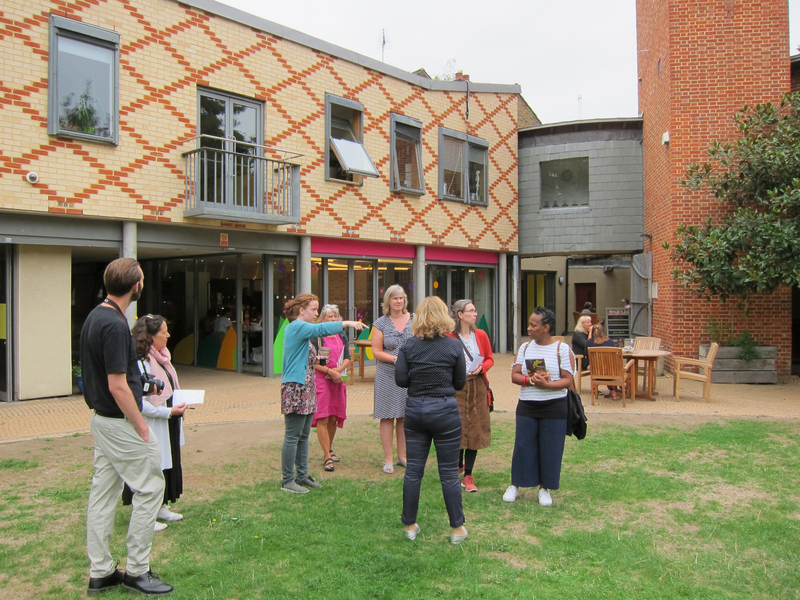 Kicking off the day at Bromley-by-Bow Centre, the participants and EDP team all met each other, and were given an overview and a guided tour by our wonderful hosts Rachel and Sara. The site itself reads like a book of architectural styles, with a post-war church space and a subsequent series of extensions, the first of which, the Healthy Living Centre, opening in 1997 and was the first of its kind in the UK. It was fantastic to see such a lively and engaging centre that is clearly well loved and used by local people, artists, social enterprises, local businesses, and park goers. 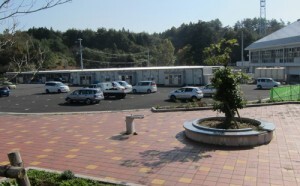 The routes through the site had been considered to great effect, and deliberate lack of signage to encourage interaction with staff members was a unique and effective idea. One participant bought up the issue of vandalism and anti-social behaviour, but we learned that incidents are very rare, and it is more important that visitors feel relaxed and welcome, with open spaces that are central to the centre’s ethos. Moving on after lunch, the challenges faced by St Paul’s Bow Common, as explained to us by Vicar Mother Bernadette Hegarty, were entirely different. A beautiful, reverential space completed in 1960, the practicalities of inhabiting the brutalist landmark are immediately apparent. The lack of insulation and expensive running costs mean the church is noisy and cold, and subsequent vicars have had to adapt and improvise over the years to make the building useable for the congregation but also the people who maintain the building. With services hidden seamlessly in within the walls, they are now very difficult to upgrade. It was useful to contrast the other stops on the tour with a church like St Paul’s: a poignant reminder of the challenges of modernising buildings that were once considered cutting edge, but are no longer fit for today’s needs. The last stop on our tour of Bow, St Paul’s Old Ford was a really beautiful example of a site that had been made to work through the sheer determination and dedication of all involved. The sensitively integrated, suspended ‘pod’ spaces are a testament to the architects Matthew Lloyd, and help generate much needed income by providing rentable spaces and accessible community facilities. Our host and guide, venue manager Karen Diss, was keen to share her invaluable insight into the process, and impress upon us not only the financial and logistical difficulties encountered with projects like this, but also the great joy when they succeed. Most attendees were from various dioceses across the country seeking guidance and design advice before embarking on their own modernisation projects. Unsurprisingly, location was a key theme that cropped up throughout the day. 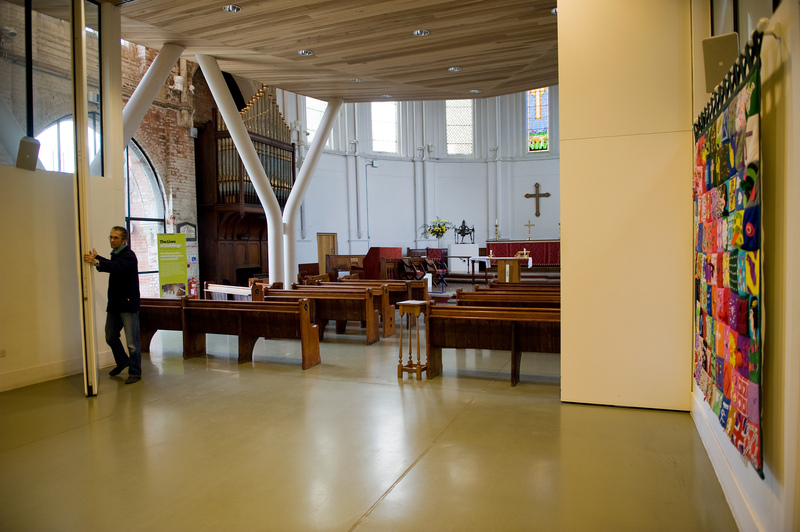 In London, where the lack of accessible community spaces is particularly acute, the church sites we visited have a unique position as they have escaped residential development and are situated in well-connected areas. The hurdles faced by rural sites are different in terms of demographics and site accessibility, so the focus here was on learning and translating key lessons to apply in different contexts. Despite the differences between the sites we visited, one key theme ran throughout the day. It is clear of the necessity for churches to stay relevant in their increasingly non-Christian communities by reinventing themselves as multi-faith and/or secular enterprises that generate income, without alienating their own churchgoing population. Grace Crannis is Outreach and Impact Manager at The Glass-House Community Led Design and member of the Empowering Design Practices project team. 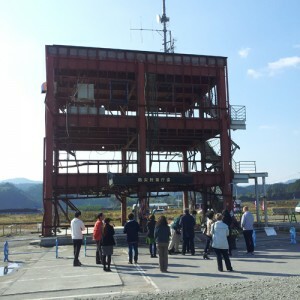 Lessons from Minamisanriku: What does place mean to us?